File this under "Severe weather can strike anywhere": A tornado touched down in Frederickson, Washington on Monday morning. While tornadoes aren't unheard of in The Evergreen State (They average about two a year), they are unusual, especially this time of year. Fortunately, the EF-1 tornado caused no injuries. Still, photos of the damage were impressive. The tornado struck several buildings, including the Boeing plant in town. The tornado also damaged several cars and knocked over rail cars in the area. Assuming a government shutdown happens Monday night, the NWS would continue operating since they protect against a "significant and imminent threat". This exemption only applies to people like forecasters, however. Weather researchers would not be working during a shutdown. The calendar may say October 1st tomorrow but the weather will feel anything but 'October-like' tomorrow afternoon. Temperatures Tuesday, and Wednesday, will warm well above average with highs expected to reach the low 80s. A weak front will stall across the area Wednesday afternoon but then lift back north into Wisconsin late Wednesday night/Thursday morning bringing another surge of warmth to the Stateline. While forecast models have flipped-flopped over the development of a late week storm this past weekend, it does look like a strong low pressure system will move across the middle of the country by the start of the weekend. Ahead of the low, strong southerly winds will draw a fairly warm and moist air mass (for this time of the year) up ahead of a cold front late Thursday and Friday. It's possible that if enough moisture and sunshine are seen ahead of the low and cold front thunderstorms that may form Friday afternoon and Friday evening could be strong. Of course the timing of the system and just how warm we get will play a big factor on storm development and storm strength, but it's something to keep and eye on over the next several days. Saturday's rains got everyone wet, but not as much precipitation as we needed. 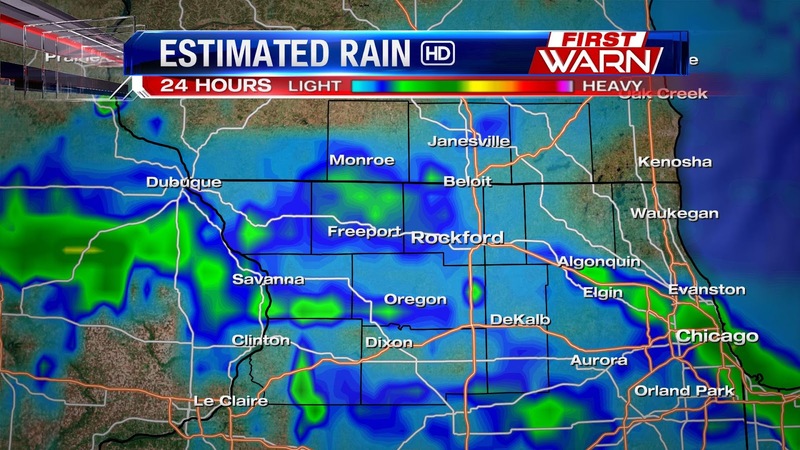 For a full listing of rain amounts click here. 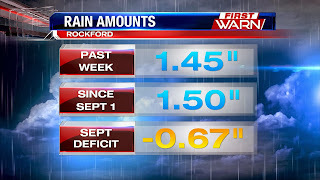 Officially at Rockford Airport we received 0.07" of rain, but we still have a 1.50" deficit for the month of September. Ahead of the cold front that advanced on the Stateline Saturday evening, it was quite windy! 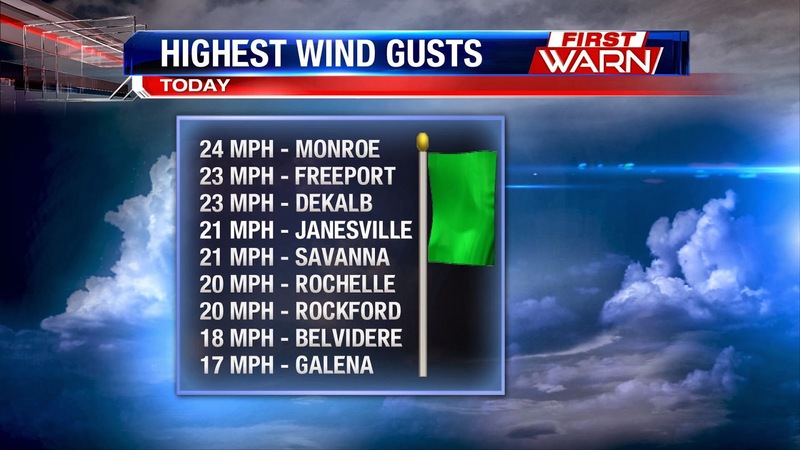 Gusts topped off near 40mph in the afternoon. Including today, it's been a week since any rain fell and nearly two weeks since we received over an inch of rain. It looks like the dry stretch will end this weekend. 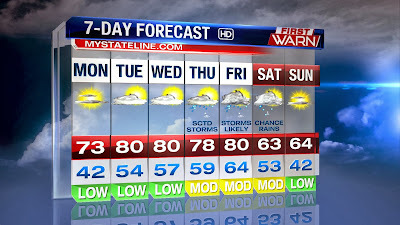 Even though rain is in the forecast it unfortunately doesn't look like a drought-busting rain. An advancing cold front will produce a few showers and even a couple thunderstorms well west of here this afternoon. As the front moves east tonight and Saturday the threat for rain will increase with time by Saturday night. Areas just east of Mississippi River could see the first drops fall as early as 3pm/4pm while most will experience rain between 5pm and 7pm - when the front is expected to move through. 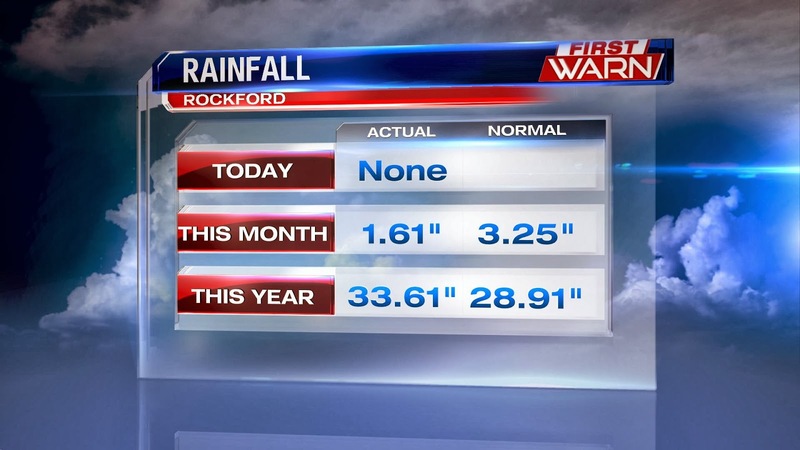 By Sunday it looks like the last of the rain will be affecting areas east of Rockford as high pressure is expected to move back in during Sunday afternoon. Rainfall totals likely won't be that impressive, but a very narrow band of moisture streaming up right ahead of the front could produce a couple tenths of an inch of rain to nearly half an inch for some. Once that front passes it likely won't be until end of next week or even the weekend that we'll see the chance for rain. It's that time of year again! 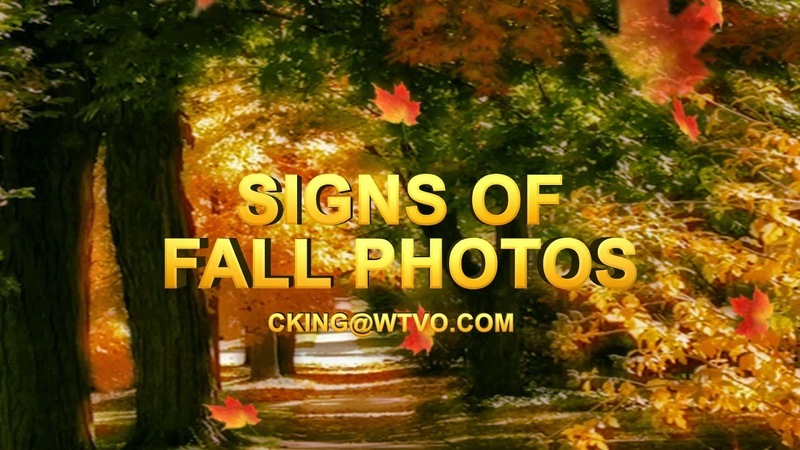 Time to send in your 'Signs of Fall' photos for our Eyewitness News Morning show! Whether it be the changing colors of the leaves, a family outing at the local pumpkin patch, fall harvest or your fall decorations we want your fall pictures! Send in your photos to: cking@wtvo.com and I'll feature them on the morning news! Don't forget you'll be able to see all the pictures we receive just by clicking on the 'Signs of Fall' image on the right hand side of the blog! We received one of our first fall color pics this week and it won't be long until we start seeing a lot more changing colors across the Stateline. So when is our typical peak? 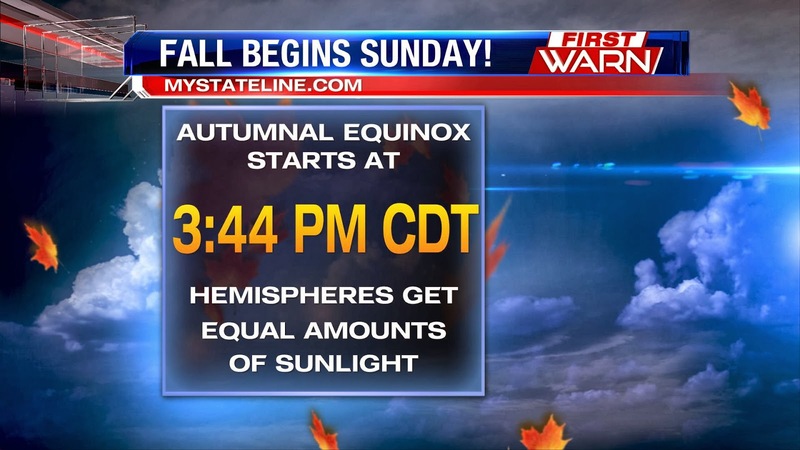 For the Stateline, it's mid October. Upstate Wisconsin usually sees its peak in early October, and is already seeing some leaves start to change. 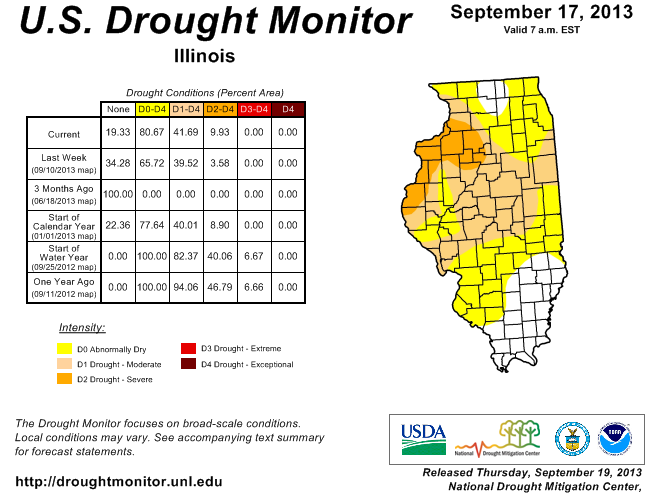 The latest drought monitor is out from the National Drought Mitigation Center and continues to show persistent drought conditions across Illinois and Wisconsin. The numbers from last week to this week haven't changed much. Wisconsin has seen a slight decrease in numbers, but Illinois has experienced a slight increase. 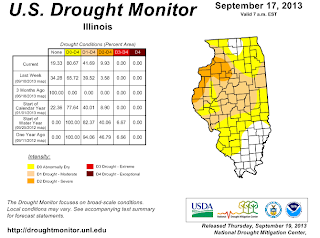 Moderate drought conditions have expanded into Carroll, Whitside and Lee counties while severe drought conditions have expanded into southwestern Whiteside County. A little rain would be nice but looking out over the next week to week in a half and it doesn't appear like that will happen. 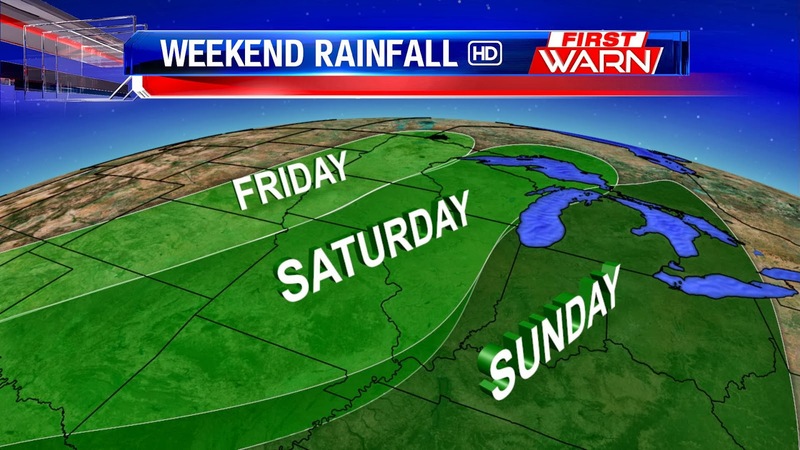 The next chance for rain will occur with the passage of a cool front Saturday and Saturday night. After that, it looks dry until the end of next week. Let's talk a little bit about what's needed to alleviate drought conditions. Heavy rainfall, from say a thunderstorm, produces a significant amount of rain usually in a short amount of time. While the rain is nice, the nature of how quickly it's coming down doesn't allow time for the rain to actually soak into the ground. 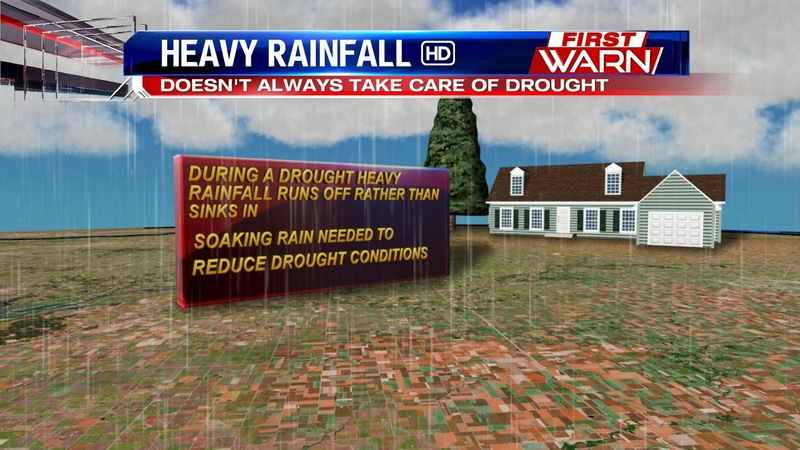 Instead, the rain runs off and if heavy enough can cause flooding. When it does start to get dry a soaking rain, like the one we had a couple weeks ago, is what usually is the most effective. Even though it makes for a dreary day the rain is able to soak into the ground and replenish the water table rather than run off right away. Of course, if it's a heavy rain that continues all day then that can cause some problems as well. 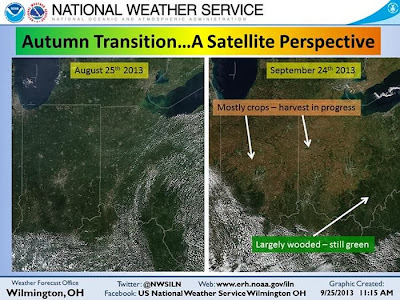 Is Fall Taking A Break? 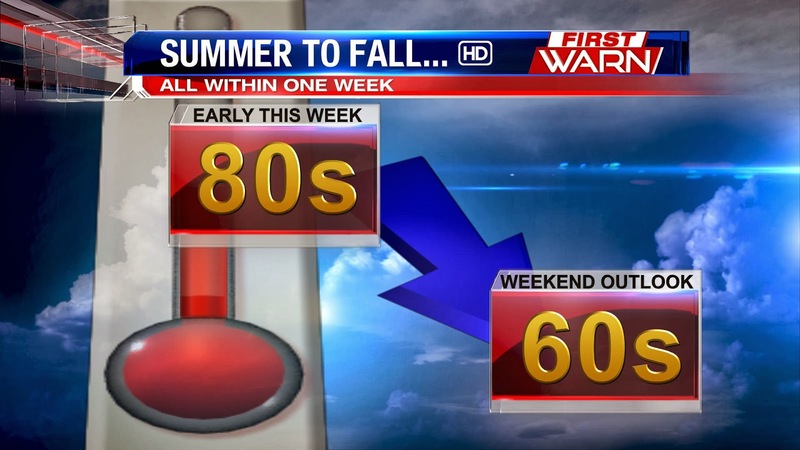 So far, the first week of fall has been picture perfect, but a warm-up over the coming days will make it feel more like late summer across the Stateline. 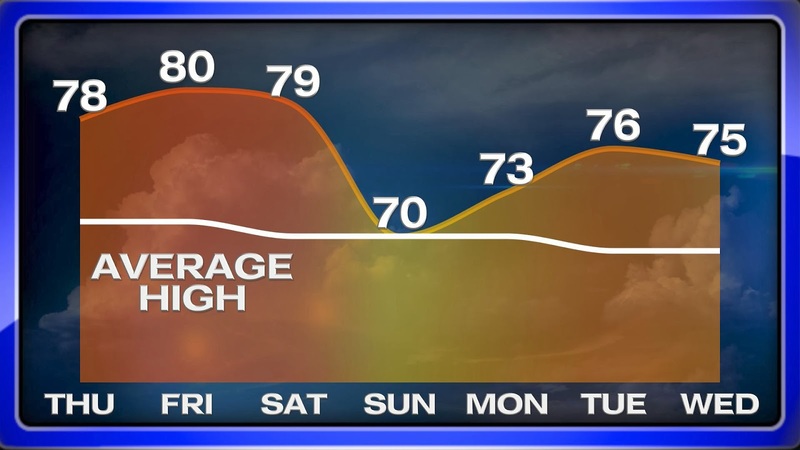 Here's a look at the temperature trend over the next seven days. 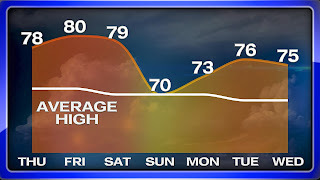 As you can see, above average temps will be the norm for at least a week. So when are we going to get our first cool snap of the fall season? 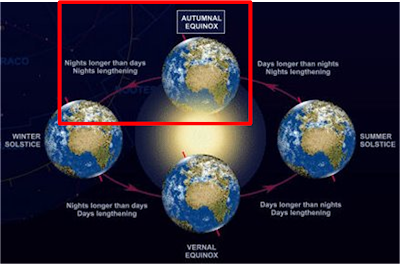 If you believe some of the long range models, it could be the first weekend of October. 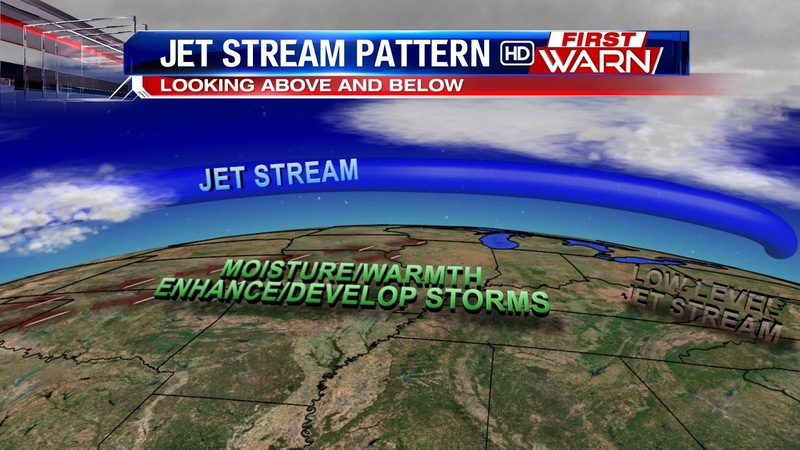 The jet stream takes a big dip, allowing much cooler air to work its way into the Stateline. Light winds and clear skies have allowed areas of dense fog to develop early Wednesday morning. 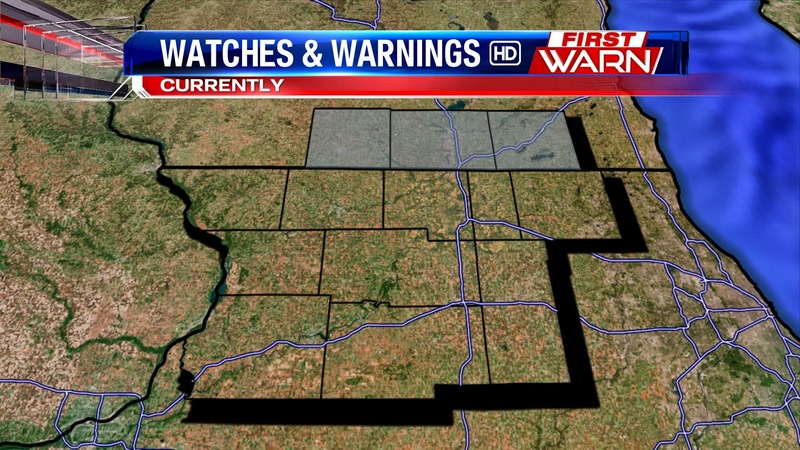 A Dense Fog Advisory has been issued for Green, Rock and Walworth counties until 9am. 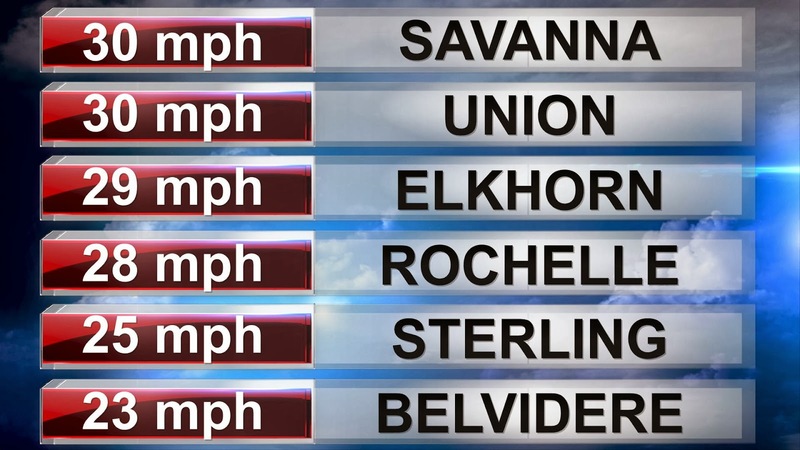 Visibility is dropping to less than a quarter mile in a few locations. Give yourself a little extra time this morning but look for the fog to dissipate shortly after sunrise. Any chance for rain this week will be limited thanks to high pressure holding firm across the Great Lakes. While a few showers were seen earlier this morning west of here associated with low pressure, drier air in place will keep the majority of those showers to the west and south. A dip in the jet stream will take that low through central and southern Illinois later this afternoon and evening and out into Indiana and Ohio by Wednesday. All we'll likely see is an increase in cloud cover through tonight. A wind shift to the East Wednesday may keep a few extra clouds around during the day but developing high pressure by the end of the week will help warm temperatures back near 80 degrees across the Midwest. 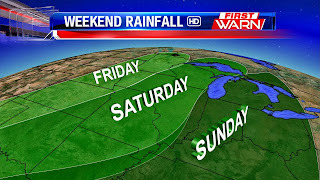 The next chance for any measurable precipitation will arrive late in the weekend with an approaching cold front. Again, moisture remains fairly limited with this but enough may get caught up with the low and cold front to produce a couple tenths of an inch. Time will tell just how much we will receive as the weekend gets closer. Best timing right now looks like Saturday night into Sunday afternoon. Congratulations Lee County for becoming a StormReady county! 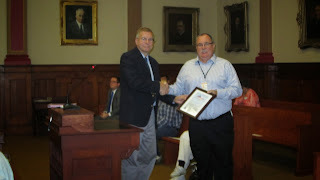 Lee County is now a StormReady county. StormReady, a program started in 1999 in Tulsa, OK, helps arm America's counties and communities with the communication and safety skills needed to save lives and property - before and during the event. StormReady helps county and community leaders and emergency managers strengthen local safety programs. StormReady counties are better prepared to save lives from the onslaught of severe weather through advanced planning, education and awareness. No county is storm proof, but StormReady can help counties save lives. 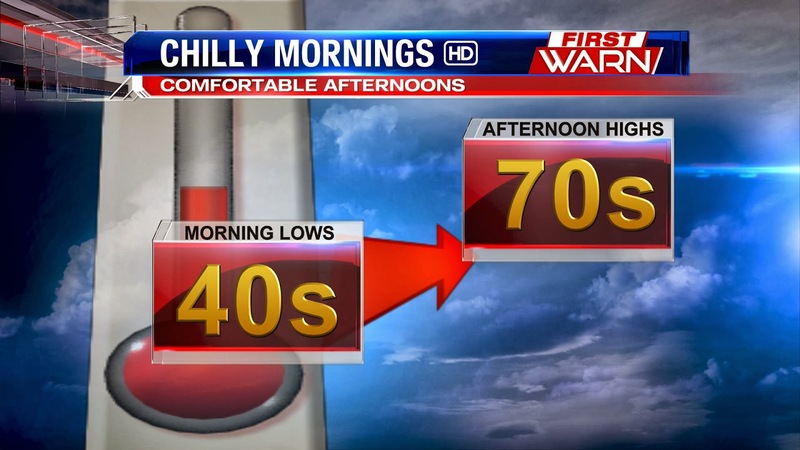 With fall officially beginning Sunday afternoon we've reached the time of year where we typically experience large temperature swings from lows in the morning to highs during the afternoon. Sometimes these swings can be as high as 25° to potentially even 30°! 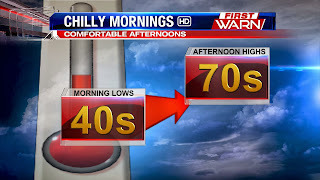 Low temperatures the next couple of mornings will fall into the 40s with afternoon highs in the low to middle 70s - very seasonable for this time of year. A gusty southwest wind will boost temperatures above average by the end of the week with highs rising into the low 80s by the afternoon. With the cold front passing early Friday, we say goodbye to the rain chances over the next week. That's not good news for drought concerns. Over 40% of the state is in a moderate drought--up from last week. 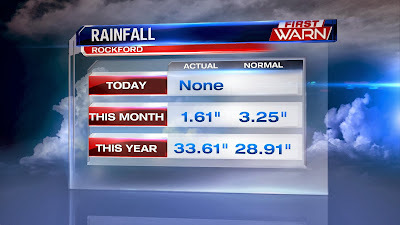 However, over the last week, we've gotten a healthy amount of rainfall. In fact, most of September's precipitation has been within the last 7 days. But the deficit will continue to grow as we have minimal rain chances in the near term forecast. 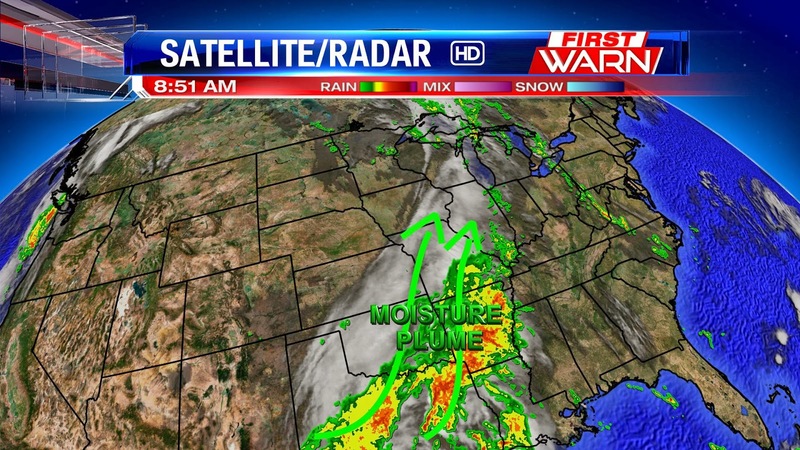 Moisture from the Gulf continues to stream northward ahead of a cold front that's passing through northwest Illinois this morning causing extensive cloud cover and even a few light showers. 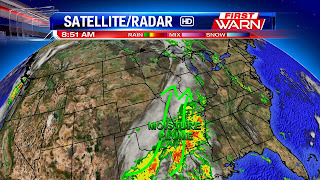 Looks like the cold front will pass between 9am and 10am taking the threat for rain with it by this afternoon. Drier air moving in with a breezy northwest wind should allow the clouds to thin a little by the afternoon, but a look further upstream across the Dakotas shows additional low stratus clouds beginning to develop. These may move into parts of the area this evening and overnight. 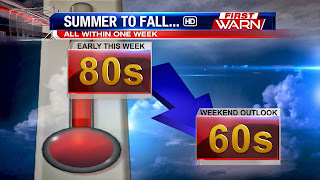 High pressure moves through Wisconsin this weekend dropping temperatures into the upper 60s/low 70s Saturday and Sunday. Quiet weather will remain in place through the beginning of next week. 9:10pm Update: Severe T-Storm Watch for northern Illinois has been allowed to expire early. 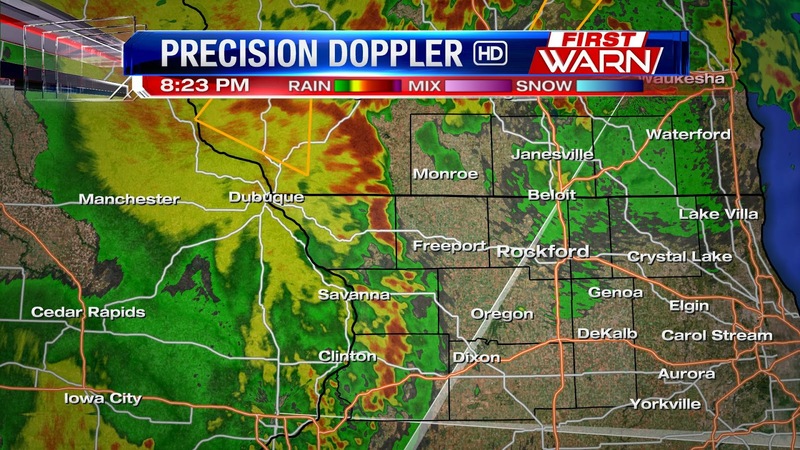 Watch remains in effect for southern Wisconsin until midnight. 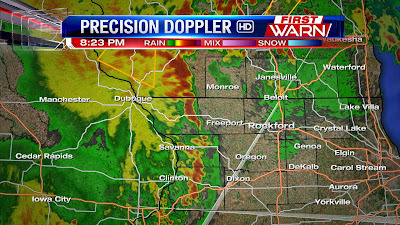 8:25pm Update: Storms have entered the Stateline, but have yet to produce any severe weather. Severe chances should stay on the low end for the rest of the night, even though some strong wind gusts and heavy downpours will still be possible. 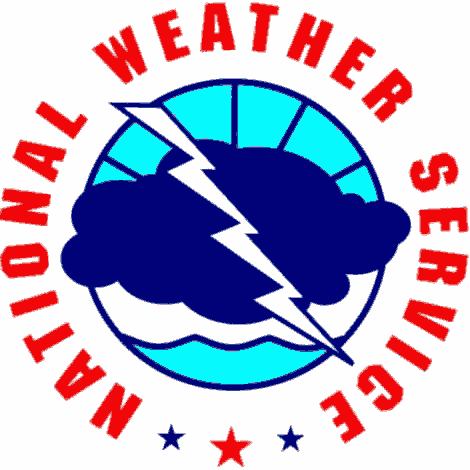 Don't be surprised if the National Weather Service cancels our Severe T-Storm Watch before the midnight expiration time. 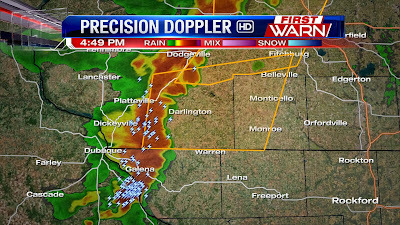 (7:42:57 PM) nwsbot: Local Storm Report by NWS DVN: Warren [Jo Daviess Co, IL] fire dept/rescue reports TSTM WND DMG at 07:25 PM CDT -- trees and power lines down throughout town. 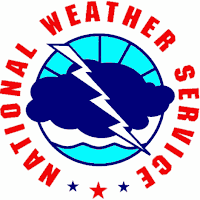 (7:13:16 PM) nwsbot: Local Storm Report by NWS MKX: 1 N Afton [Rock Co, WI] trained spotter reports TSTM WND DMG at 05:59 PM CDT -- large tree limb down - 6 to 8 inch diameter. time estimated from radar. 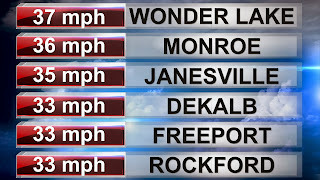 (5:33:38 PM) nwsbot: Local Storm Report by NWS MKX: 3 SW Monroe [Green Co, WI] amateur radio reports TSTM WND GST of M65 MPH at 05:20 PM CDT -- tree branches 4 inch diameter snapped and downed power lines. 5:55pm Update: A Severe T-Storm Warning has been issued for northeast Green, Rock and Walworth counties in Wisconsin until 6:45pm. These storms are capable of 70mph wind gusts. 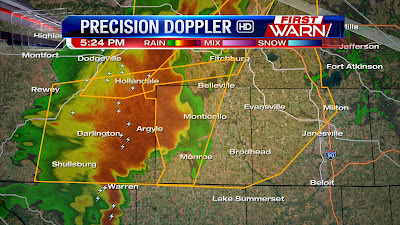 5:25pm Update: A Severe T-Storm Warning has been issued for Green and western Rock conuties in Wisconsin until 6:00pm. 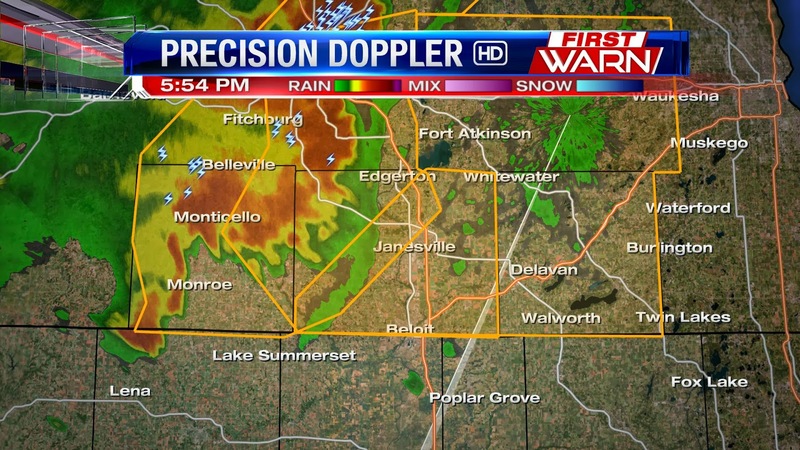 These storms are capable of nickel size hail and 70mph wind gusts. 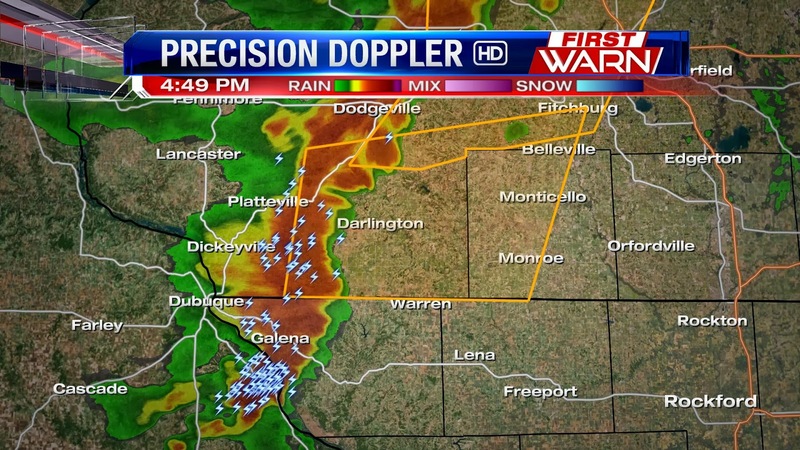 4:50pm Update: A Severe T-Storm Warning has been issued for western Green County in Wisconsin until 5:30pm. 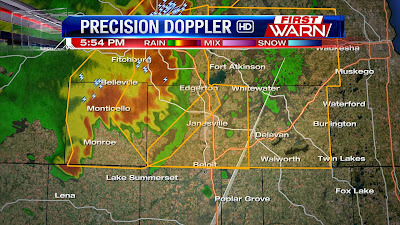 These storms are capable of half-dollar size hail and 60mph wind gusts. 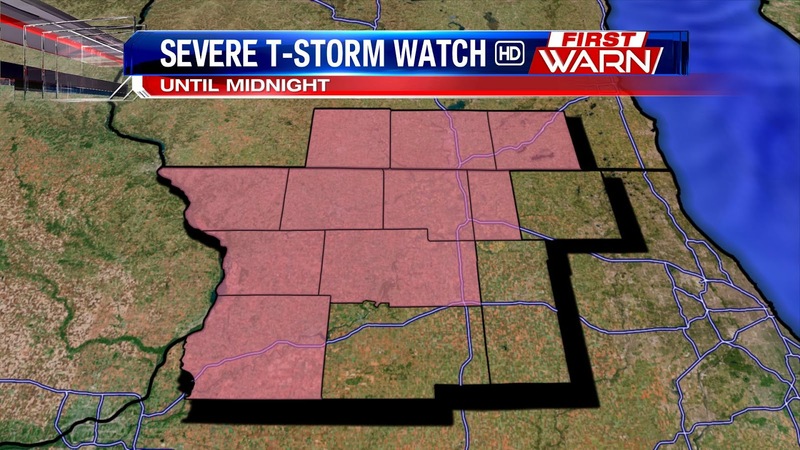 A Severe T-Storm Watch remains in effect for most of the Stateline until midnight. 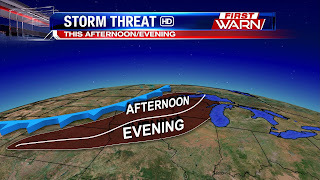 Stay tuned to Eyewitness News, MyStateline.com, and the First Warn Weather blog for the latest on this developing weather situation. 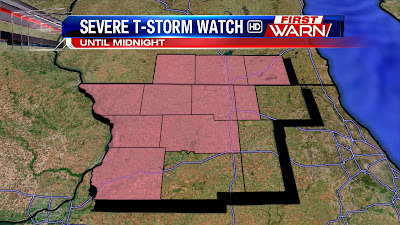 A Severe T-Storm Watch is in effect until midnight for most of the Stateline. 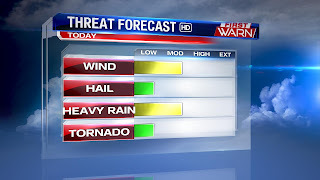 Storms tonight could produce strong winds, heavy downpours, and small hail. 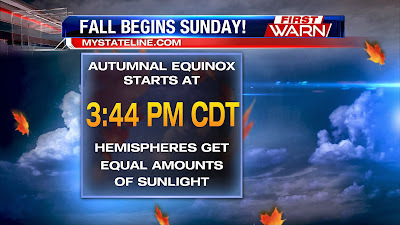 Stay tuned to Eyewitness News, MyStateline.com, and the First Warn Weather blog for more on this developing weather situation. As clouds continue to thin this afternoon the temperature will continue to rise through the upper 80s. As those clouds thin the instability in the atmosphere will continue to rise ahead of a cold front currently stretching from south-central Minnesota into western Iowa. It's that cold front that will trigger additional storm development later this afternoon and evening. The majority of the afternoon the skies should remain quiet across the immediate Stateline. Thunderstorms will likely begin to develop within the next couple of hours from northern Wisconsin southwest into Minnesota and Iowa. 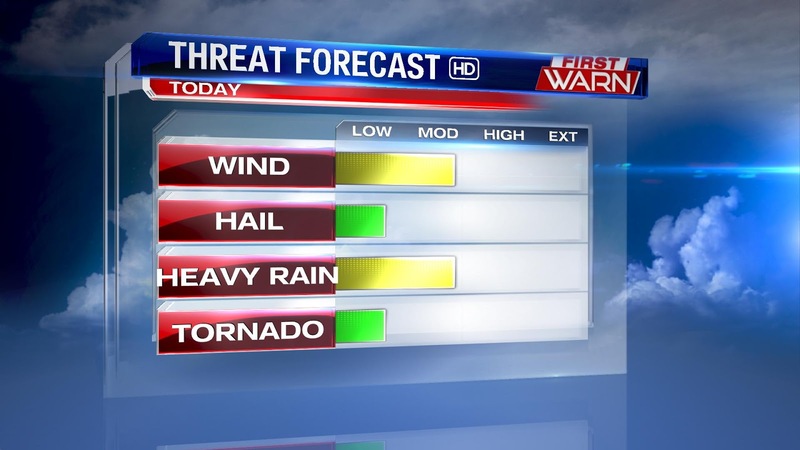 Storms that do form this afternoon will be capable of producing strong, damaging wind gusts, hail and heavy rain. As the storms progress east into the evening over the Mississippi River the threat will transition to more of a wind and heavy rain event into the overnight. The amount of available moisture in the atmosphere remains a little over an inch, which is fairly high. The Storm Prediction Center continues with a slight risk for strong to severe storms across Northern Illinois and Southern Wisconsin and the First Warn Weatherisk remains at a Moderate. Here is the forecast radar from the National Weather Service's WRF model for 7pm tonight. Most short-term, smaller scale models indicate an initial start time for storms around eastern Iowa and northwest Illinois to be between 5pm and 7pm with storms advancing east and impacting Northern Illinois after 7pm. Individual storms that develop through the afternoon - even if they're west of the Mississippi River - will be capable of wind, hail and heavy rain. A line of storms will likely begin to form as the afternoon/evening progresses and the sun begins to set lowering the threat for large hail, but keeping the potential for wind and heavy rain. Be sure to stay up-to-date with the weather later this afternoon. 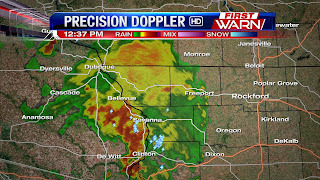 Meteorologist Brandon Arnold and myself will be tracking and monitoring the radar this afternoon. Further updates will be provided right here as well. 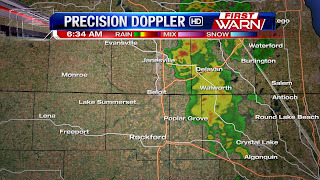 Non-severe thunderstorms continue to develop across Wisconsin and northern Illinois early this morning. 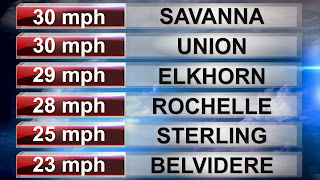 These storms were forming along a warm front that stalled just to our west Wednesday afternoon due to the showers/storms that moved through the Stateline. Along with the front, the low level jet has increased helping to enhance the storms this morning. The low level jet is basically an area of stronger winds (just like within the main jet stream) that are found roughly 3,000-5,000 ft above the surface of the earth. 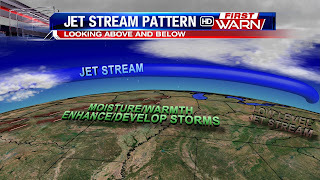 Winds in the low level jet help transport warmth along with moisture from the south and southwest and can often times help ignite storms during the overnight or help enhance storms during the day. Typically, a couple hours after sunrise the low level jet will weaken usually indicating a decrease in storm coverage if there are no additional fronts or storm systems moving in. 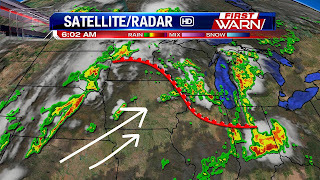 As the warm front lifts north into Wisconsin later this morning and the low level jet weakens the current storms will begin to decrease in coverage. Additional thunderstorms will be possible late this afternoon west of a line from Monroe to Freeport and then for areas east this evening and overnight. These storms will form along a fairly strong cold front that won't completely pass the Stateline until midday Friday. Heavy rain and a few gusty storms will be possible later tonight. Additional details on the forecast for tonight will come out later this morning. While scattered storms will be possible overnight Wednesday and during the day Thursday, a strong cold front will move through overnight Thursday, bringing the best rain chances we've seen all week. It looks like severe weather will stay to our west for the most part, but storms on Thursday night and Friday morning will still bring plenty of rain. 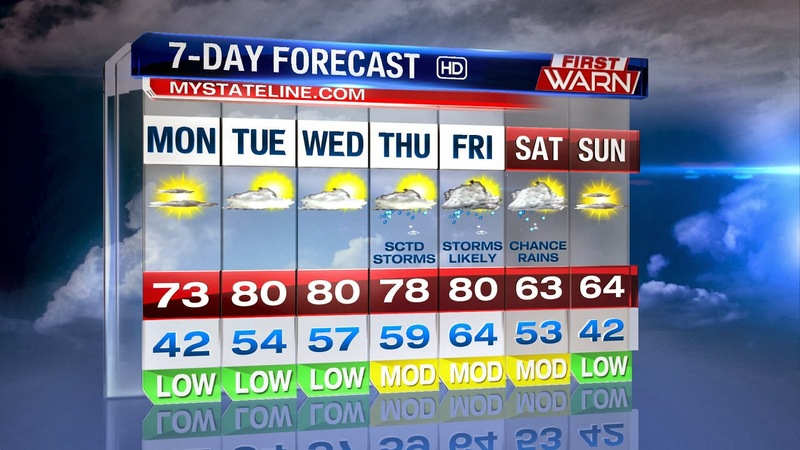 Another 0.5" to 1.0" of rain could be possible for the Stateline through the rest of the work week. 12:40pm Update: Showers and embedded thunderstorms will continue to move east across Illinois and Wisconsin through the afternoon. 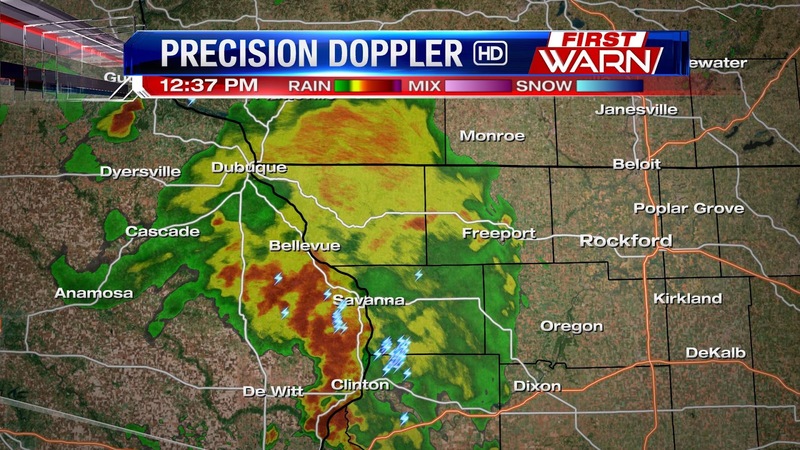 As of right now, it looks like the heaviest of rain/storms will move southeast through parts of Carroll and Whiteside counties, but moderate rain from time to time can be expected for some over the next few hours - heavier rain where thunderstorms occur. 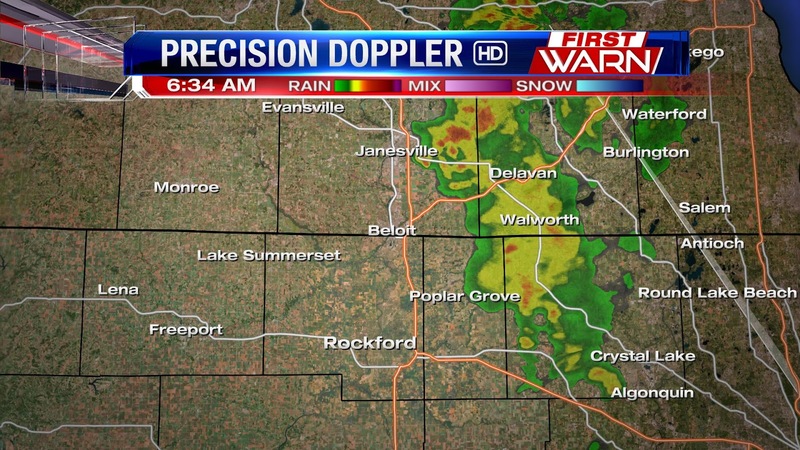 Light to moderate rain will continue to roll east into southeast Wisconsin and northeast Illinois this morning. 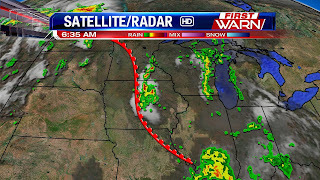 While a little clearing will be likely within the next few hours, thunderstorms developing along a warm front in central Iowa could move in by late this morning and early afternoon. These storms may weaken a little as the low level jet begins to weaken but I'm still going to hold on to the chance of an isolated thunderstorm through the afternoon. 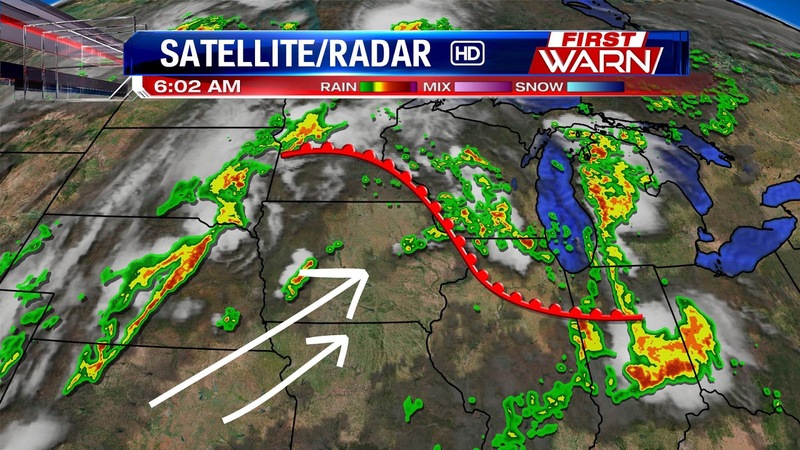 The warm front will lift north into Wisconsin today bringing a warmer and a little more humid air mass into the Stateline by tonight. Heavier thunderstorms will be likely later in the afternoon on Thursday and Thursday night along a strong cold front. 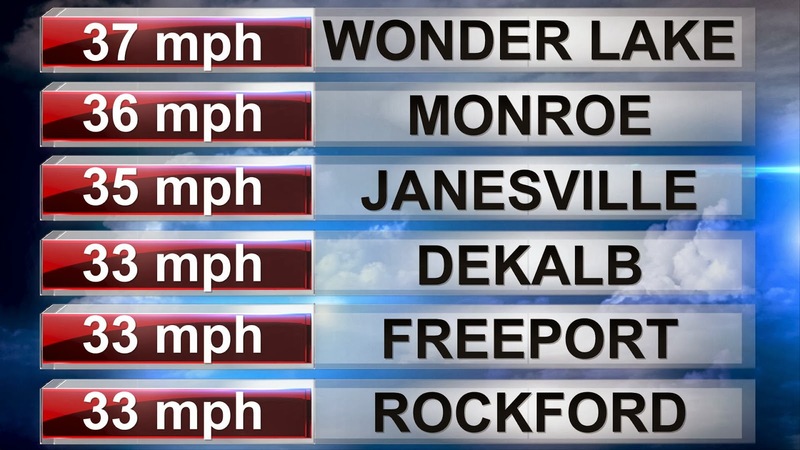 Monday afternoon weather update: Hot & humid!